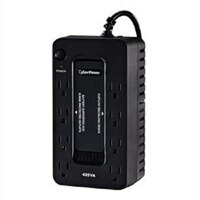 CyberPower Standby Series ST425 - UPS - AC 96-140 V - 260 Watt - 425 VA 2.9 Ah - output connectors: 8 - BlackThe CyberPower ST425 uninterruptible power supply (UPS) system provides battery backup and surge protection for lightning-induced surges and other power events that can damage electronic equipment. This unit delivers enough battery backup to power connected electronics through utility power failure and enough runtime to perform a graceful shutdown to protect against the loss of data and damage to valuable electronics during longer outages. Including a sleek design, this UPS is perfect for all your home office and entertainment needs, including computers, gaming consoles, and broadband routers.